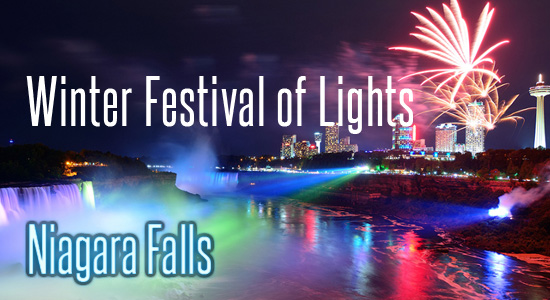 Info Niagara, Niagara's premiere destination guide, invites you to enjoy Canada's foremost illumination festival – the Ontario Power Generation Winter Festival of Lights in Niagara Falls – as they capture the magic of the holiday season from November 16, 2019 to January 12, 2020. Experience Niagara Falls as it's transformed into a palette of breathtaking colours with millions of sparkling lights and illuminated displays located within the Niagara Parks Winter Wonderland and adjacent tourist districts. Illuminations include the world's largest Canadian-American Flag, fifteen Canadian Wildlife displays, Niagara's iconic Skylon Tower, and the two-storey high Zimmerman Fountain, the light show on the Power Generating Station, the three-dimensional Angels at the Niagara Parks Police Building and Noah's Ark. Do not miss the Laser Light Shows at the Top of Clifton Hill and WFOL Opening Ceremonies in Niagara Parks Queen Victoria Park. Both the illumination of the Falls and the Festival’s illuminations occur nightly from 5:00pm to midnight. While there is no cost to view the illuminations, donations are gratefully accepted ($5 - $10 per car; coach bus’s $1 per passenger) with all proceeds used to enhance the lights and displays. The OPG Winter Festival of Lights launches on NOVEMBER 16, 2019 with the Lighting Ceremony in Queen Victoria Park! Lighting Ceremony concludes with the 'flipping of the switch' and a spectacular fireworks performance. Welcome to enjoy the stunning light displays and over 2 million lights displayed along the Niagara Parkway, Dufferin Islands and throughout Niagara Falls. 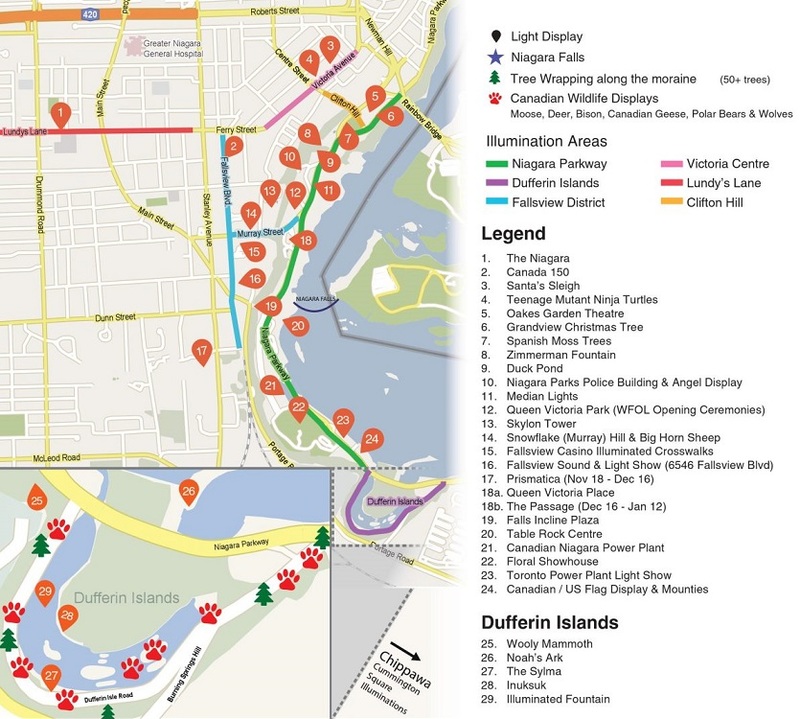 Most of the Festival’s lights and displays are located along the an 8km stretch of the Niagara Parkway between Clifton Hill and Dufferin Islands. Also there are numerous exciting illuminations are located within the Fallsview District, Clifton Hill District, Clifton Hill & Lundy’s Lane. Other events in the festive calendar include Winter Fireworks Program presented by Fallsview Casino Resort, Sparkle Lighting Awards, ET Canada New Years Niagara Falls, plus additional weekly programming. The 2019/2020 OPG Winter Festival of Lights Winter Fireworks Series, presented by Fallsview Casino Resort, will feature twenty five (25) fireworks shows during the WFOL Season. All performances take place at 9PM unless otherwise noted.